NOW Glucosamine, Chondroitin & MSM combines three of the most popular and effective nutrients for supporting joint health in one dietary supplement. 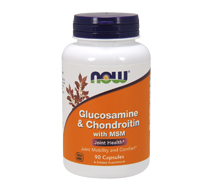 Now's Glucosamine and Chondroitin are both 100% sulfate, the most studied form of these nutrients. Directions: As a dietary supplement, take 3 capsules daily with meals or on an empty stomach.